No pressure then! It was practically the perfect storm of things a knitter doesn't want to hear - black is horrible to knit in the winter, the recipient knew exactly what they wanted, but no pattern was suggested and as my sister wanted to surprise the recipient, no measurements or opinions on patterns were available! I found the Astronomer pattern and suggested knitting it plain without the stripes, but my sister decided that actually, her friend quite liked stripes but I could choose the colour. After Christmas I went to the p/hop yarn swap at The Yarn Cake in Glasgow and picked up an absolutely beautiful skein of 4ply BFL yarn from Ripples Crafts. The colourway was the wonderfully named 'Ancient Hill Tartan'. I wasn't sure what to knit with this until I realised that I really needed an easy to pull-on-and-wear hat too. I've got several lovely berets, but these always need 'arranging' to look right and with two small kids, I rarely have time for 'arranging'. 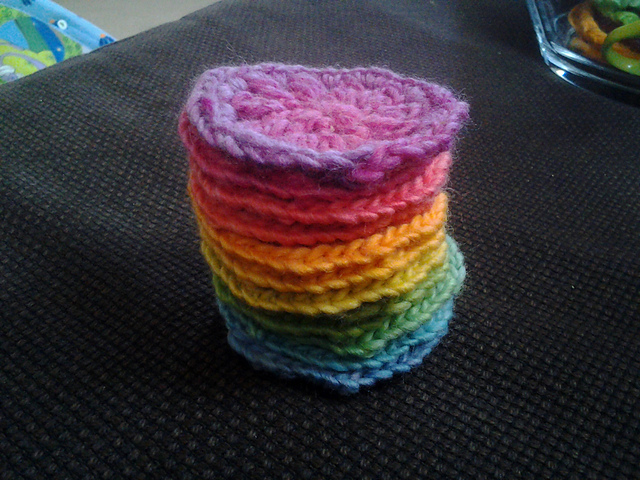 A while ago, I knitted three Sock Yarn Hats for my daughter and the sons of a friend. 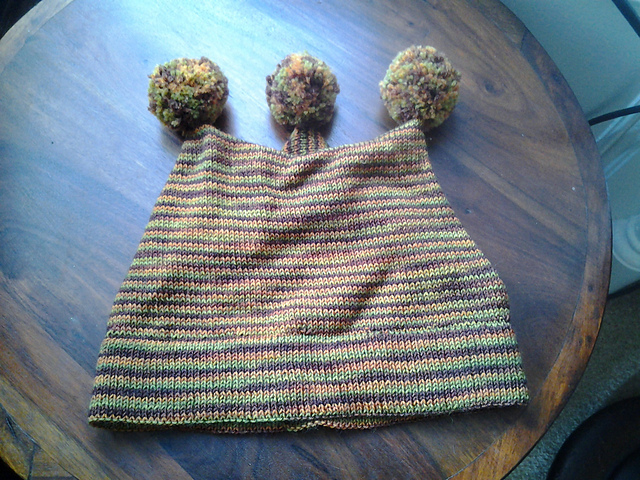 It occurred to me that this would work just as well for me and the pattern went right up to adult sizes. I knitted it on 3mm needles. The turned brim is lovely and warm over my ears and it's the perfect pull-on-and-wear hat. I'm not sure that it showcases the colours in the yarn as well as it could, but it might well be one of those yarns where the colours are always going to look better in the skein than knitted up. I've just realised that these photos don't showcase the colours particularly well either - winter light in Glasgow isn't great for photography. 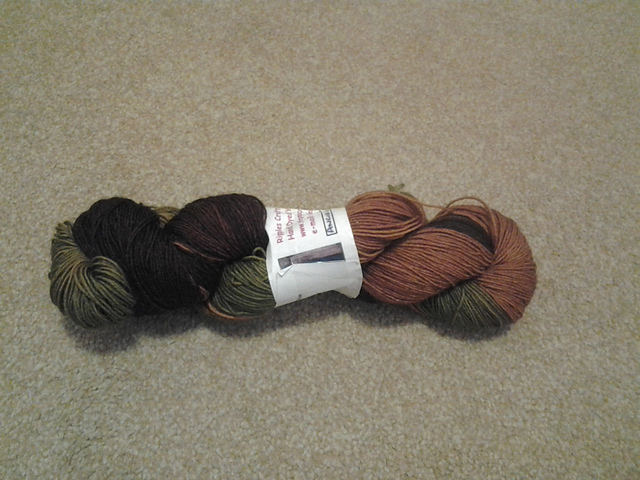 There's a lovely deep plum, a burnt orange and an olive green. 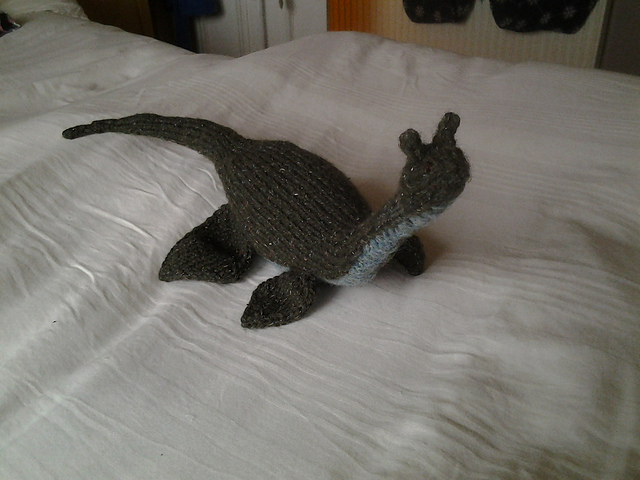 Nessie number 1 was knitted for my son's first Christmas. He's a lovely traditional Nessie with a dark green hide and lovat belly. He's generally found swimming around D's bedroom or waiting patiently at the foot of the cot. I suspect Nessie number 2 is an entirely different breed. 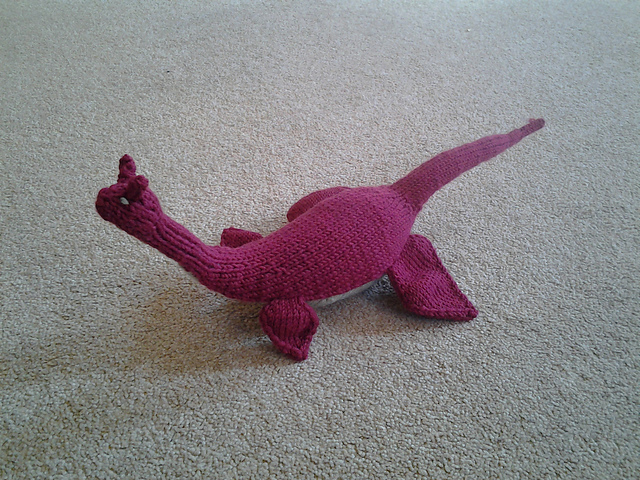 Knitted for my daughter's 4th birthday (because she saw D's Nessie and wanted one of her own), she's an individual sort of reptile with a purple hide and lime green belly. Apparently she might fly! 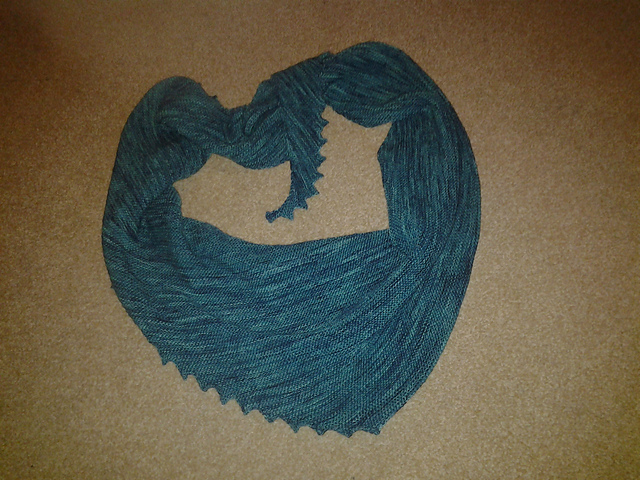 For both Nessies' the pattern is Loch Ness Monster by Hansi Singh. It's beautifully written and the construction and shaping are lovely. I knitted them on 4mm needles. The traditional one uses New Lanark Aran yarn and the individual one uses Drops Big Merino. First up today was a birthday gift I knitted for my daughter almost exactly a year ago now. She was getting a doll's bed for her birthday that came with a little mattress, pillow and sheet and I felt that it needed a snug blanket to finish it off properly and keep her doll cosy. I used New Lanark Aran in a lovely pale teal colour that they call Lovage Blue and improvised a cable design on 5.5mm needles with a seed-stitch border. I really like the effect of the off-set adjacent cables and wouldn't mind revisiting this on a larger scale in the future! 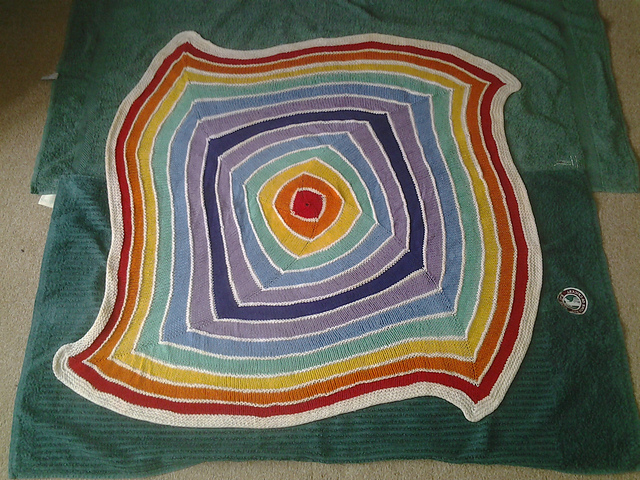 Next is the blanket that I knitted for the birth of my son (also about a year ago now). I used the Chasing Rainbows pattern by Trisha Mitberg, but improvised a bit with cream garter ridges between each colour and a cream border. The yarn is Pisgah Peaches and Creme worsted weight cotton, knitted on 4.5mm needles. I like cotton blankets for babies as it makes for easy laundry and is not too hot. While I was knitting the green band of the blanket, I ran out of yarn about a round and a half before the end. I'd used this yarn previously for a wash-flannel for my daughter and she very graciously allowed me to rip out her wash cloth and use it to finish off the green band. After this, when I was working on the outer colours, she would come over and look hard to see where 'her yarn' was. I did knit her a new flannel as compensation. 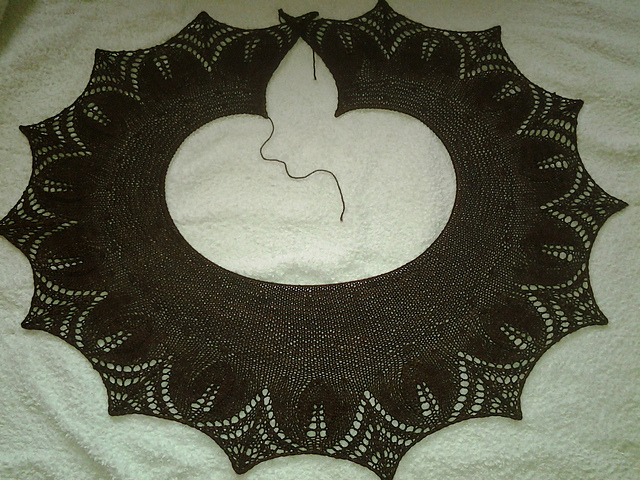 Later, when I was knitting the garter ridge before the final red band, I ran out of cream yarn. This was more of a problem as I had nothing else that would substitute, and cream aran-weight cotton isn't really that easy to come by in winter / early spring. I put an appeal out on Ravelry and a lovely lady in the states offered to wind 100g off a cone that she had stashed. She sent it to my FIL in boston and he brought it back to the UK for me, allowing me to finish the blanket. The first is some thing that has become a regularly worn part of my wardrobe and I'm not sure I could do without it. This is the Hitchhiker Scarf by Martina Behm. 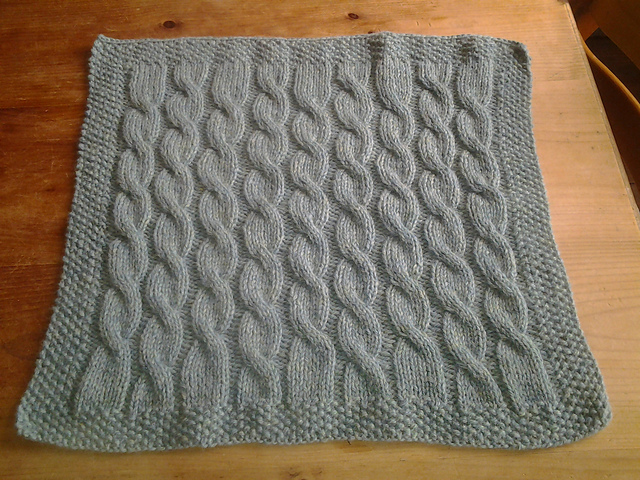 I knitted this using some very old Fyberspates Cobweb Lace yarn that I held double. Jen did not produce this yarn for long, it was quickly superceded, but it's lovely both to knit with and wear. This photo does not really do the colour justice. It's a mixture of deep turquoise and blue-green through to almost inky blue in places. I got 52 'teeth' out of my skein with a little left over. This second scarf is something that I knitted on holiday when my son was about 8 weeks old and I felt that I wanted to knit something I could get my teeth into a bit without being a massive project. I've never really worn it yet, but it is lovely and I'm sure I'll work out what it looks good with eventually. This is the Primavera Shawlette by Lidia Tsymbal. I knitted this from some Dye for Wool 4ply in the colourway 'Burnt Cinnamon Roll' that I received in a secret santa swap at The Yarn Cake. It's a lovely yarn with some depth and variation in tone and best of all, I only used half the skein so I can use it for something else too. 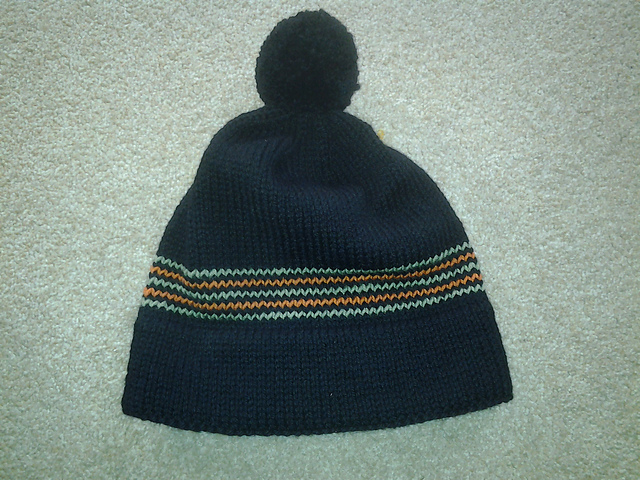 Knitted on 3.75mm and 4mm needles. In an attempt to resurrect my blog and get it going again, I'm going to show you all projects that have been finished in the last year while I was on maternity leave. There is no particular order to how I'm going to do this, it could well depend on availability of photographs when the blogging mood takes me! 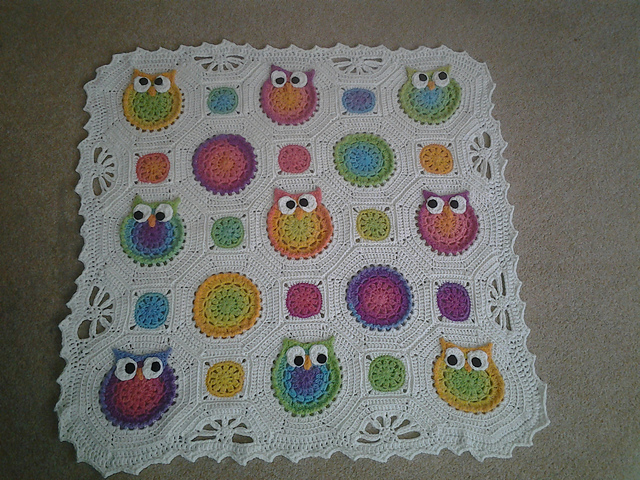 First up is Owl Obsession. I crocheted this for my new nephew who was born in November. The pattern is amazing... 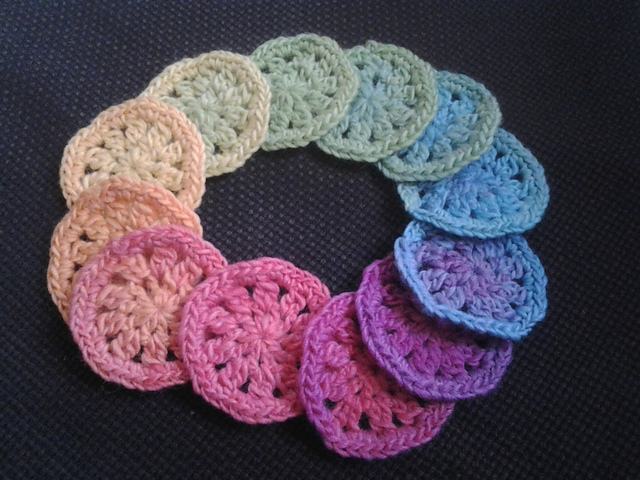 I have not crocheted in any meaningful way for years and have never successfully followed a pattern but I needn't have worried. The level of detail in the instructions and the photographs provided are brilliant. The yarns I used were KnitPicks Chroma Worsted in the colourway Lolly Pop and Drops Big Merino in cream. The Knitpicks is not easily available in the UK and not at all in this colourway but a friend bought it for me in the USA and my father-in-law brought it back with him to the UK. The colours were absolutely addictive. I finished this in no time at all and even the making-up and finishing flew by. 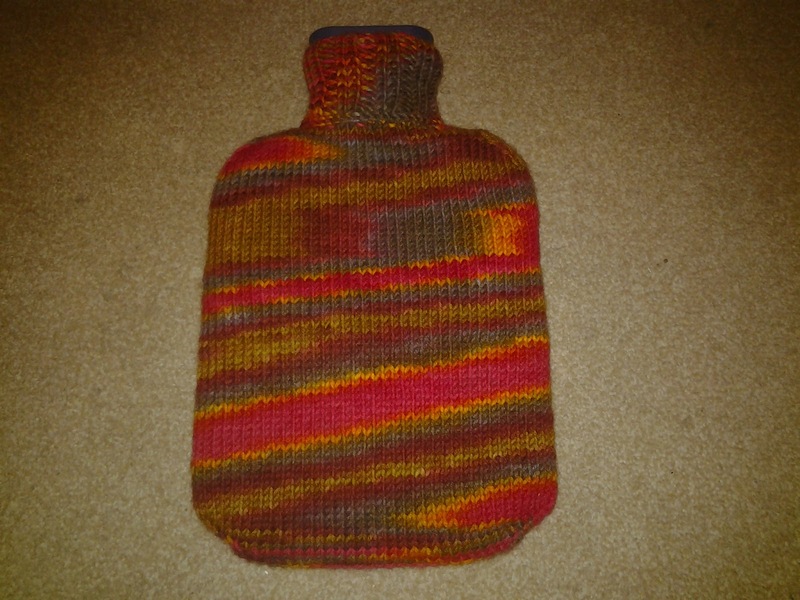 I'm really pleased with the finished product - it's warm, colourful and perfect for a winter baby. This post was originally intended as a Making Monday post two weeks ago, but the vagueries of using blogger on a tablet (most notably the inability to move pictures around) put paid to the timeliness of the post. at home and I just can't seem to summon the necessary enthusiasm for knitting in the evenings. On the back of the work on the study though, I've been looking closely at our storage, especially for our recently growing collection of kids art and craft stuff. My sister gave me a stack of sturdy cardboard boxes which all had plain bases but rather blingy lids. 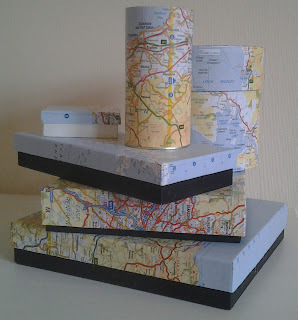 I had a go at covering these with maps from an old road atlas that was out of date. I used pages relating to areas that were either significant to us or where the map itself was particularly pretty. Since I originally started putting this post together, I've covered a few more boxes. 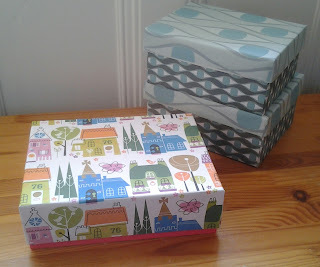 I've discovered that kids shoe boxes are a lovely size for storage of small things and also found a sturdy Neals Yard box worked well. 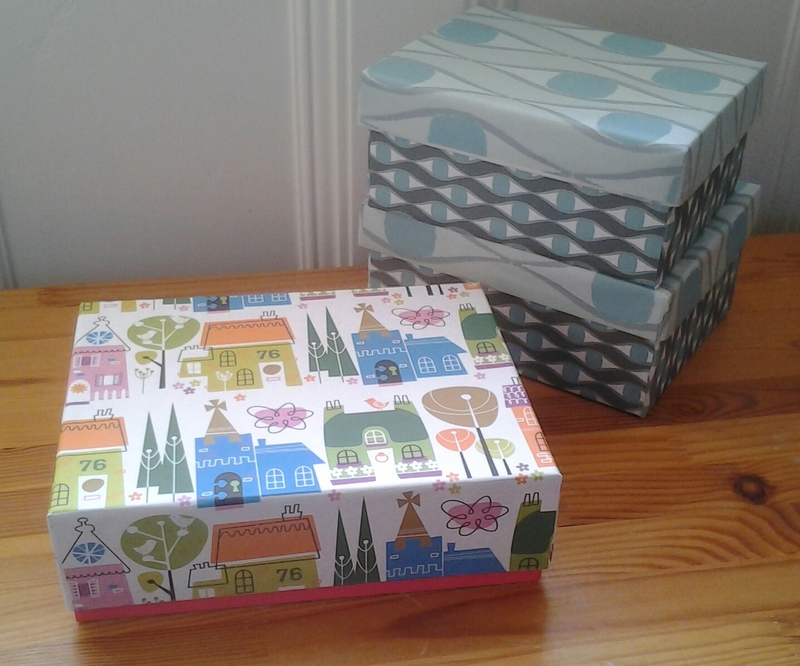 For these boxes, the paper I used was good quality wrapping paper. The only downside I can see to this spate of box-covering is that it really eats up glue sticks! 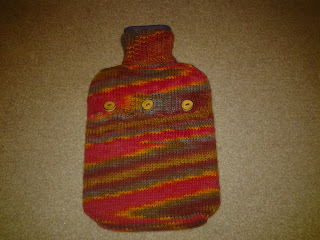 It seems that in my hands, hot water bottle covers last about 5 years. 5 years ago, I wrote this post about a new cover for my bottle to replace the one I'd made 5 years before that. Now, 5 years on, my bottle needs a new cover again. Last time, it appears that I didn't make a very good yarn choice. I used Debbie Bliss Cashmerino Aran which I happened to have in stash and which was a lovely shade of green. 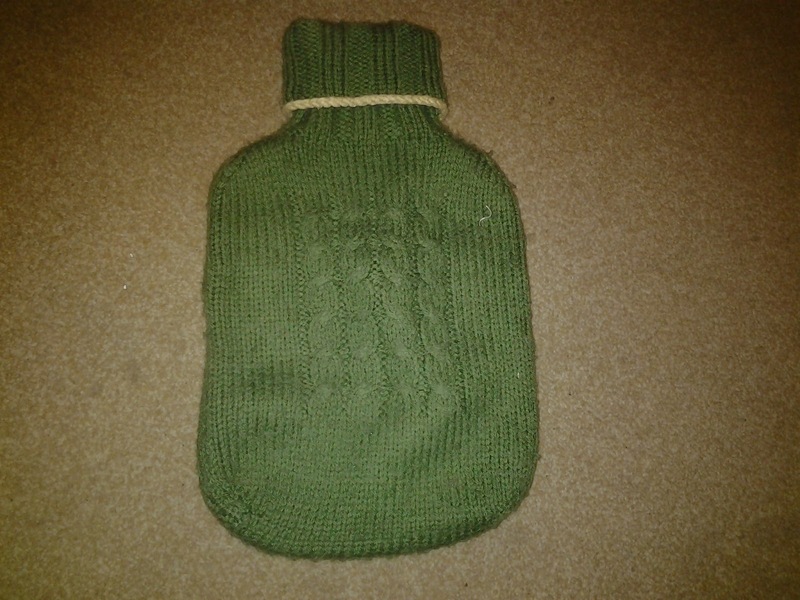 Over the years though, repeated exposure to heat had 'killed' the 33% microfibre content in the yarn so that the cover didn't hold it's shape any more and was all baggy and thin. This time, I wasn't making that mistake again, so I went for a 100% wool yarn. I've had a couple of skeins of Plum Knits 100% cashmere aran in my stash for about 8 years and have never been sure what to use it for. Early on, I didn't want to use it in case I wasted it, and more recently, I've struggled to find someing I wanted to make that would only use 175 yards of handpainted aran weight. This seemed like perfect match of pattern and yarn and since my hot water bottle gets heavy use in the winter, it's as good a use of a luxury yarn as any. I used the Jessie pattern as the basis for my cover again, but once again omitted the intarsia heart. I also tweaked the stitch count as my gauge was slightly off and I wanted a snug cover. The biggest modification I used this time was to knit in the round starting with a magic cast on on the bottom edge. This eked my meagre yardage out a bit and meant no seaming. It got really tricky mid-way up the back with the button bands, but I just put the stitches for the bottom (inside) band on a holder, cast on more stitches for the top (outside) band on my working needle and carried on in the round. At the end, I had to go back and rejoin and knit the bottom band and sew it in at the edges which wasn't a big deal. I reused the buttons from my previous cover as they were a good match. In the end, the neck is a little short but sufficient and I had less than a yard of yarn left over. 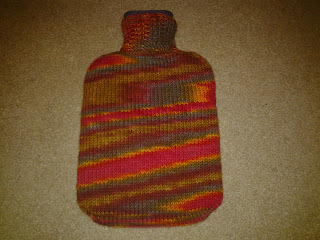 The colour pooling is a little odd, but I'm happy to live with that as it's something I primarily use while I'm asleep! The cover is soft and squishy and I was thinking that if it felted a little over time with use, it might even last longer than the standard 5 years!